In a bowl, add shrimp and season to taste. Refrigerate. Heat oil in a pot or large frying pan. Add onion and bell pepper, and sauté until tender. Add rice and cook while stirring. Add wine and continue to stir until it evaporates. Add hot broth, a little at a time until it covers all the rice. Continue to stir the rice so it doesn’t stick. Once rice is almost dry, add more broth and repeat the process until the rice is fully cooked, although it should be al dente. After 15 minutes, add broccoli and peas. Add orange zest. 5 minutes before rice is ready, add shrimp and cook until they change color. Add half the cheese while the rice is still in the pot. Serve immediately and garnish with more cheese and chopped parsley. You can add your favorite vegetables or leave them out completely. You can also add a touch of heat by adding a little chopped chili pepper when sautéing the onion. A well made risotto is one of the best dishes you can have: creamy, al dente and full of flavor. Once you learn the basic technique of a risotto, you can make hundreds of variations to please your taste. 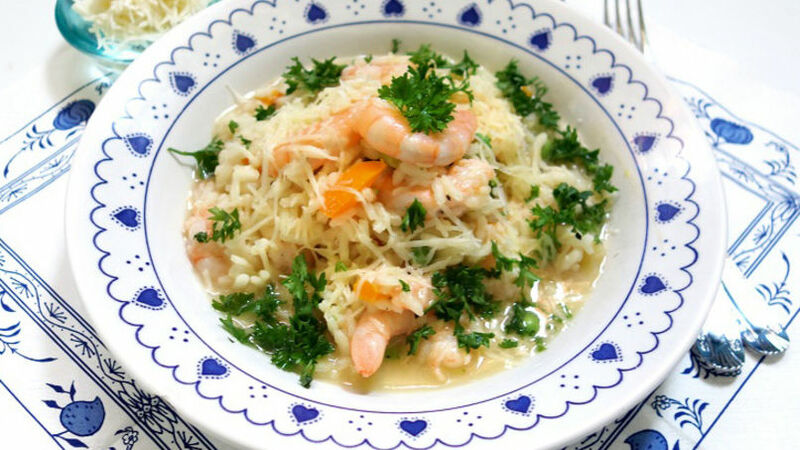 For best results, use the best ingredients: seasonal vegetables, a nice broth and freshly grated cheese. Risotto was my son’s favorite recipe when he was a little boy and he even learned how to make it. Whenever we had guests over, he would make them his specialty, and he surprised everyone with his delicious creation. Try it and make it your way. You’ll love it.